Leeson Electric stock motors include both AC and DC designs, from sub-fractional horsepower through hundreds of horsepower for general-pupose use and specific duty applications. Leeson is also a leading designer and manufacturer of application-specific AC and DC motors and offers a database of over 30,000 custom designs, experienced application and design engineering teams, and the unique collaborative environment of the Leeson Design Center. ESR keeps a variety of Leeson motors in stock and since we are located 20 minutes from their Charlotte warehouse, we have quick access to many more Leeson motors. Leeson offers Premium Efficient Open Drip Proof and Totally Enclosed Fan Cooled General Purpose Motors. All motors 1HP and above are inverter rated. Leeson offers Premium Efficient Severe Duty Motors from 3 to 20 horsepower and Lincoln Severe Duty Motors from 1 to 800 horsepower. Leeson's IEEE-841 Motors are designed for harsh environments that require a premium efficient motor. Leeson's Explosion Proof Motors are Dual Labeled Class I, Groups C & D-Class II, Groups F & G for application in hazardous environments having certain explosive gases or materials present. Lincoln NEMA Premium Totally Enclosed Fan Cooled Crusher Duty Motors are ideally suited for size reduction equipment including rock crushers and pulverizers and other uses in the aggreagate and construction industries. Leeson offers a variety of Single and Three Phase Washdown Duty Motors. They are available in painted and stainless steel models and both NEMA and IEC/Metric frames. Leeson's Speedmaster Inverter-Duty/Vector Duty Motors are designed for inverter or vector applications where up to a 2000:1 constant torque speed range is required. The Lincoln line also features C-Face Inverter Duty Motors from 1/3 to 200 horsepower. Leeson offers Single Phase and Three Phase Open Drip Proof and Totally Enclosed Fan Cooled General Purpose Brake Motors. They also offer Washdown Duty Brake Motors. Lincoln Automotive Duty U-Frame Motors are ideally suited for a wide variety of tough applications found in automotive manufacturing facilities and other industries utilizing U-Frame motors. Leeson's Close-Coupled Pump Motors are available with either NEMA JM or NEMA JP mounting provisions. They are designed for continuous duty service on close-coupled pumps. Leeson offers a variety of Totally Enclosed and Open Drip Single Phase Motors designed for many applications. Lincoln Medium Voltage Motors are ideally suited for applications requiring heavy duty large horsepower electric motors. Leeson DC motors are typically used with an SCR controller in applications requiring adjustable speed and constant torque throughout the speed range. Leeson offers General Purpose, Washdown, and IEC DC motors as well as DC Gearmotors. Leeson high efficiency IEC Motors meet North American performance standards and premium efficiency mandates. 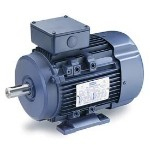 Leeson offers both AC and DC Metric Motors. Applications: machine tools, textile machinery and other equipment with metric dimesions but requiring the heavy-duty torqeu and performance of motors designed for use in North America.